😆 Ain’t it the truth? And ironically the Duke boys didn’t even own or use firearms during the show’s seven seasons. This entry was posted on Friday, May 25th, 2018 at 1:33 pm and is filed under Humor, Politics, Society. You can leave a response, or trackback from your own site. David Hogg’s hypocrisy knows no bounds or, at least, he and his handlers in the MSM aren’t going to let those bounds stand in the way of either his agenda or his notoriety. 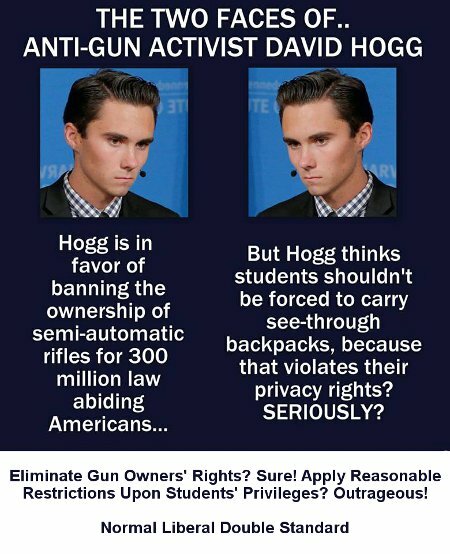 He’s all in favor of curtailing and infringing upon Americans’ 2nd Amendment rights but is quite angry about he and his fellow students being forced to use clear backpacks on campus and to be required to wear student IDs. 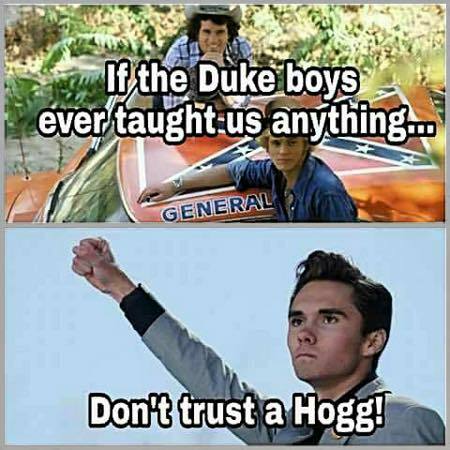 Then again, hypocrisy might not be the most accurate description, even if Hogg is sincere in his beliefs and not just a cynical, manipulative sociopath seeking fame and fortune in a media career. After all, Liberals and Progressives have long held that neither all rights nor all people are in fact equal and deserving of equal protections. This entry was posted on Sunday, April 1st, 2018 at 8:16 am and is filed under 2018 Elections, Politics. You can leave a response, or trackback from your own site. Yes, it’s not really the high schoolers who are the children right now. 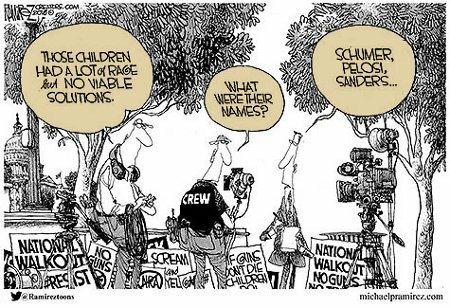 It’s the infantile Democrats in Congress, e.g., Schumer, Pelosi, Sanders, and their screaming, ranting ilk who are behaving like unruly, undisciplined, and ill-behaved children who’ve been told that they can’t have the toy that they want. The high schoolers, inane, unthinking of the future, and easily manipulated as they are, are at least trying to take control of their fate and, to some extent, act to protect themselves from a perceived threat. Of course they’re quite apparent rage isn’t completely mindless. It’s more than little manufactured since they have to pander to what was once the Far Left of their Liberal and Progressive base. 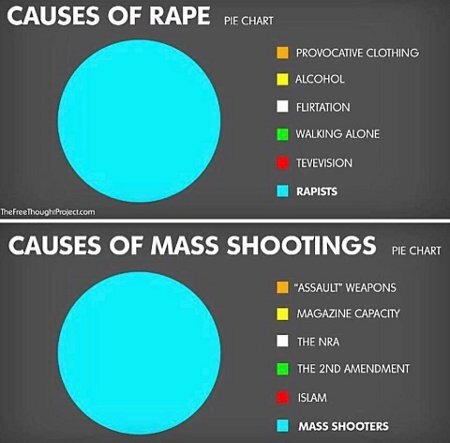 Hence, with the complicity of- and aid and comfort from their Lamestream Media, they will bitterly cling to any every firearm-related / firearm-involved tragedy that isn’t Black-on-Black crime…or the attempted mass assassination of Republicans. This entry was posted on Sunday, March 25th, 2018 at 11:40 am and is filed under 2018 Elections, Politics. You can leave a response, or trackback from your own site. Whenever there’s an “appropriately” high profile crime that involved the use of a firearm – this particular time being Devin Kelly’s massacre of 26 people in First Baptist Church in rural Sutherland Springs, Texas – Americans are immediately assaulted by the Liberal and Progressive gun-grabbers. 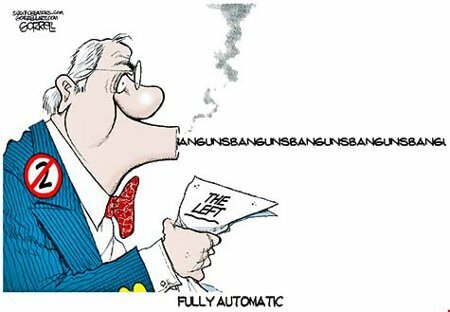 And yes, it’s a full-auto assault; a rapid fire attack of blamecasting, hoplophobia, and the vilest hatred towards the American people. Ironically, the shear volume of the gun-grabbers’ attempted verbal suppressive fire clearly indicates that they’ve gone beyond mere high-capacity magazines of vitriol and spite and have switch to belt-fed systems. 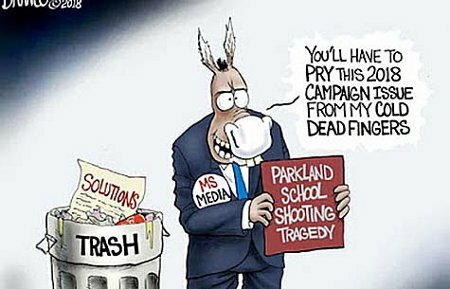 The only difference between the Sutherland Springs massacre and previous killings of note is that the Liberals and Progressives changed their strategies. They’re no longer committing targeted attacks against GOP lawmakers and the NRA as an organization. They’ve switched a strategic warfare model, targeting any and all NRA members and Republican voters. This entry was posted on Saturday, November 11th, 2017 at 7:34 am and is filed under Politics. You can leave a response, or trackback from your own site. Yes, it’s in our nature to seek out who or what is to blame for any crisis – sometimes so much so that common decency is left by the wayside. Of course more consistently and less hypocrisy when it comes to blame would be nice. It’s a shame that the hoplophobic Left can’t manage that. Then, consistency and probity aren’t in their natures. This entry was posted on Wednesday, October 11th, 2017 at 6:02 am and is filed under Politics, Society. You can leave a response, or trackback from your own site.